Cable installation can be a finicky thing. People without appropriate knowledge and training cannot be employed for the installation of the cables, since they may end up with work that causes network failure. End users might have the experience of running telephone cables so that they want to take the risk of wiring network cables. In fact, telephone cables can tolerate quite a lot of errors, but that is not the case of the data cabling as it is quite sensitive to cable errors. Therefore, to avoid potential network error and reduce your risks of costly mistakes, here are several things you should know before the cable installation. The first thing you should bear in your mind is that the cabling work won’t stop with the initial installation. More cables and optical devices will be added. Thus to make sure that you label appropriate cables, color-coded cables, or implement some other kind of process to make it easier to identify cables later on. What’s more, adding ladder rack, rack-based cable management makes ongoing maintenance much, much easier. The following image can easily illustrate the importance of fiber cable management. Data cabling used UTP (unshielded twisted pairs) to achieve its goals. The magnetic field generated by the low voltage running through the cable is a critical component of the communications chain. When you run this unshielded cabling in parallel with electrical cables, that magnetic field is disrupted and the communication becomes noisy and garbled. In many cases, transmissions will simply not make it from Point A to Point B. In other cases, transmission rates will slow to a crawl as communications are constantly retried. If you have to go near electrical power lines, cross them in perpendicular instead. From personal experience, a newly installed coaxial cable can be easily out of work if they are twisted around the overhead electrical cabling that ran between the two buildings. 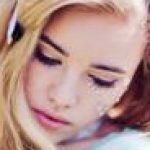 It is known that the typical distance limitation for UTP cabling with up to 1 Gbps is 100 meters. However, if you’re running cabling for some other purposes, such as 10 Gbps or 40 Gbps, be mindful of the distance limitations associated with the type of cabling you intend to use. For example, if you intend to run 10 Gbps for up to 100 meters over twisted pair cabling, you need to use Category 6A or better cabling. 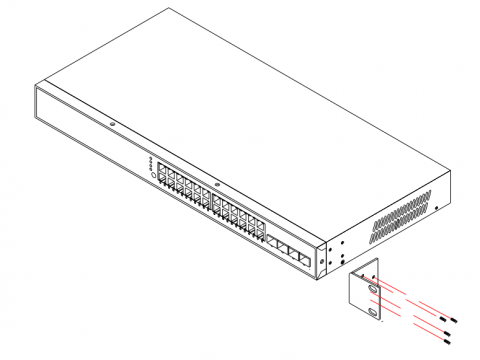 Or if you are running 10 Gbqs for up to 10 km, you need to use 10GBASE-LR SFP+with patch cord LC-LC. Maybe your network only provisions 100 Mbps network connections to the desktop for now, even though the 1G Ethernet has become a ubiquitous standard. But suppose you are going to move to a new location and you need to install new cabling. 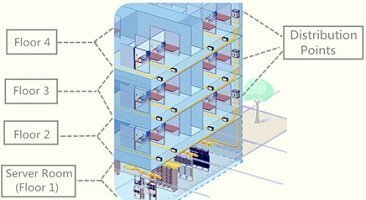 Are you going to go with yesterday’s best cabling technology or are you going to install something that will meet today’s needs and your needs for the next few years? Remember, labor is the most expensive part of your project. While top-of-the-line cable won’t be the least expensive option, you should consider reasonably high-end cable for your installation. Maybe you don’t go with the absolute best, after all, many organizations won’t need 10 Gbps to the desktop for quite some time but don’t go for cheap, either. Many users might have the fallacy that there are only eight individual wires inside a cabling jacket, so why not terminate them at random as long as you use the same scheme at both ends? Of course, that is a bad idea. The cabling standards, known as EAI/TIA-568-A and B have existed for a reason. This standard defines how the cables are twisted and placed in the jacket. If you deviate from those standards, you risk introducing noise and inefficiency into your cable plant that can have a negative impact on overall network performance. 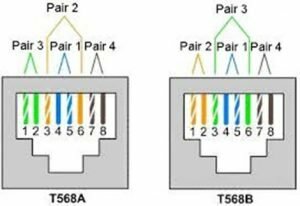 The following image shows UTP Cable Termination Standards EIA/TIA 568A and EIA/TIA 568B, and the only difference is that the green and orange pairs are terminated to different pins. Once the cabling is installed, you should test every cable using appropriate tools to make sure that it will be suitable for its intended use. 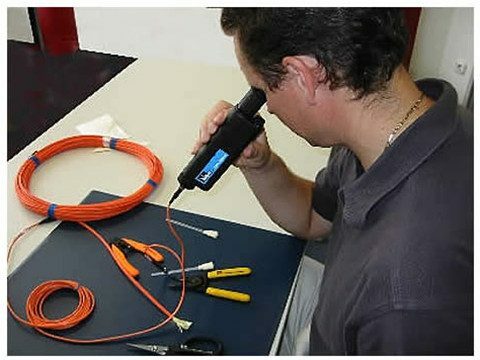 Fiber optic testing of newly installed systems not only verifies that the system meets its design requirements but also creates a performance baseline for all future testing and troubleshooting of that system to support the evaluation of warranty claims. The following image shows a Visual fault locator (VFL), designed with a visible laser and universal adapters like FC, SC, and ST etc., which can help the user easily locate faults on the fiber link. This testing typically includes verifying length and cable specifications matched to needs. If you need 1 Gbps transmission speeds, verify that the cable’s properties will support that need. This testing result will ensure that the data necessary to properly evaluate any future system malfunctions will be available. The amount of information carried in two strands of optical fiber would require a copper cable four inches in diameter. When considering the space constraints, required bandwidth, and long distance transmission needs in today’s applications, fiber optic products are the only viable choice. Easy installation and upgrades allow you to meet future growth needs and install spare fiber today for a more economical choice than installing additional cables later. 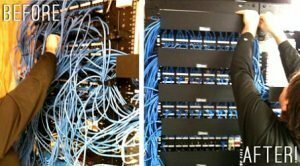 To sum up, improperly installed cabling can cripple network performance, create maintenance headaches, and lead to hidden costs. Besides the above tips, you are supposed to increase error-free work with trained technicians. 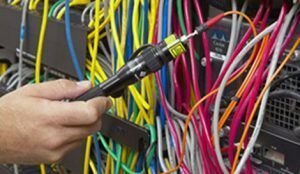 Because the best practice in cable installation is a professional with the proper tools and certifications to ensure the proper installation of the network cabling. Note that a beginner who has little experience in cable installation should be instructed under a professional technician to proceed the cable installation.